If you are going to get serious about scouting, sooner or later, you are going to have to venture into unfamiliar territory. That might mean exploring public land, or a new piece of property that you've gained access to, or maybe just getting out of eyesight of those landmarks like roads or fields that you've been hunting around. Whatever the case, you need to be able to navigate with a topographic (topo) map of the area. For deer hunters, anything other than a 7.5 minute quad with a scale of 1:24,000 is pretty worthless - it won't show enough detail to translate into what you are seeing on the ground. You can get paper 7.5 minute quads directly from the USGS or from a variety of other places. If you are computer literate - I assume you are since you are looking at this online - you can purchase mapping software or find free sources on the internet. I use the Topo! State Series Software from National Geographic. It isn't cheap (about $95 for Tennessee and Kentucky) but you get some really neat tools and the ability to print out custom maps on your own inkjet printer. I recommend their adventure paper for printing. Again, it isn't cheap, but it makes the maps waterproof and virtually indestructible. OK, on to the basics of topo maps. 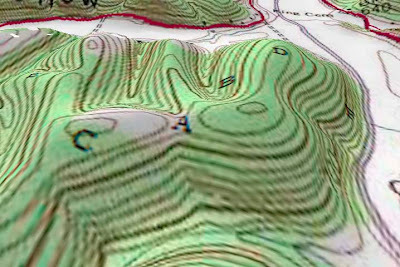 Topo maps are a way to represent the three dimensional hills and valleys of the real world on a flat two dimensional map. 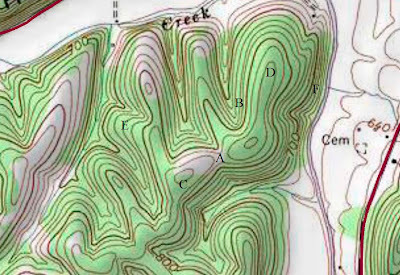 The brown lines, called contour lines, connect points of equal elevation. On the examples I've shown here, each line represents a twenty foot change in elevation. One way to visualize a contour line is to imagine flooding the landscape simulated in the bottom 3-D view with twenty feet of water and drawing a line around the shoreline, then adding another twenty feet of water, and drawing another line, repeating until everything is flooded. The last line you would draw would be at the top of the highest hill, like point "C". Point "B" is in a valley, or hollow. Notice that the contour lines make a sharp V shape. A rule of thumb to remember is that the V's always point toward the head or top of the hollow and the open end of the V points toward the mouth of the hollow. Compare the shape of a hollow to the typical shape of the contours for a ridge. Point "D" is at the north end of a ridge. Notice that the contour lines are rounded or U-shaped at the end of the ridge. Another feature that deer hunters are interested in identifying on a map is a saddle, which is a low spot where two hills or ridges come together. Often deer will travel through a saddle to cross from one side of a ridge to the other. Point "A" is in a saddle which can be identified by the two sets of U-shaped countours whose rounded ends point toward each other. One final point. You can determine how steep a hill is by looking at how closely the contours are spaced. Point "E" is on a gentle slope. Notice that the contours are spaced much further apart than at point "F" which is a very steep hill. In the next navigation article, we will show how to use a topo map in conjunction with a compass. I may even get on my soapbox and talk about how a GPS is no substitute for a map and compass and knowing how to use 'em. Thanks Chris. We'll do our best.